A detailed, cinema-centric inventory for all aspects of the facility. 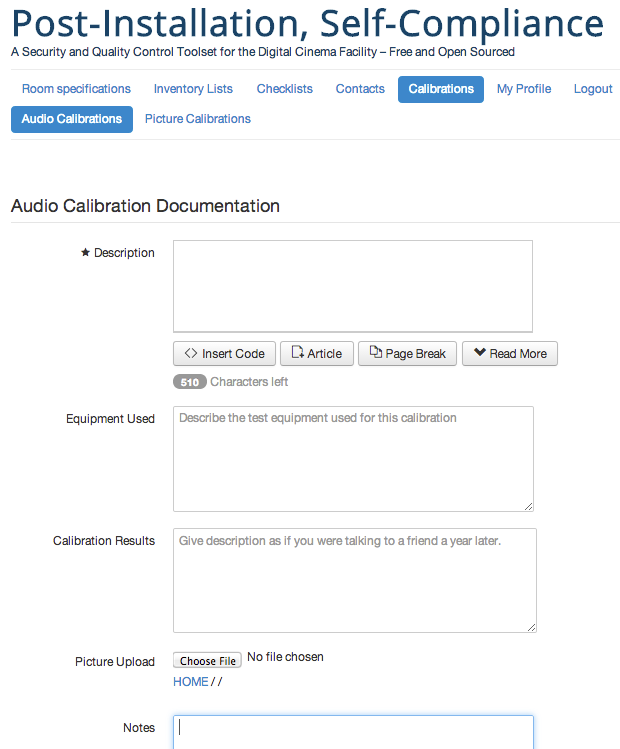 A repository for both audio and picture calibration setup notes. A set of checklists for checking different sectors on a Daily/Weekly/Monthly/Quarterly and Yearly basis. One-click download, one click install. It automatically builds an Access Control List pyramid so that a multi-multiplex director can pass it down to multiplexes and then their technical people with ease and security. The database can designate certain data as RESTful, which makes it a critical step for implementing FLM and TKR. Integrates with open source graphics tools such as NVD3. Includes a Journal for disseminating information to employees. Future APIs to enable manufacturers to implement their data front-end for manufacturers testing or monitoring protocols and reports. Any study of Quality Control quickly finds itself centering on the ISO standards of the ISO 9000 family. It has been developed by a world-wide group of interested parties for a number of reasons. They are explained on their website, but one of the purposes and results have been that companies can deal with other companies who have each gone through the ISO 9000 processes and have a great deal of certainty that they are getting what they expect. It should be clear that there is no supposition in the ISO protocols that promises the best product in the world. It actually is much easier than that – the company who has done the work to get accredited is merely stating that their systems of operation are designed and controlled and constantly internally certified to generate what they promise. It could be a very standardly produced medium quality product or super deluxe. What has happened in the world of very large businesses and many government contracts, the organizations will only purchase their equipment – from carpets and drapes to high-tension steel – from ISO-certified vendors. Cool, but what does this have to do with me in the digital cinema-centric projection room? Indeed, it may be a goal of the ISO that everyone world-wide will run their operations according to their protocols, but this isn't going to happen soon. But that isn't to say that we can't learn from their techniques. So we'll express the software toolset being introduced here as being "...in the style of the ISO 9000 principles". In this series we'll look at some of the nuance. Now, to explain the meaning, "...for the rest of us". It is presumed that the larger cinema organizations have proprietary software and procedures in place that catalog each piece of equipment just by the nature of their accounting systems and the interface they have by ordering large numbers of product. But surprisingly, it doesn't take too long while going down the cinema-organization-size pyramid to find chains who are still running their equipment lists on glorified spreadsheets. Which is OK as far as it goes...there are unfortunately those who don't even have that, trusting that their suppliers or NOC have organized everything for them. What's the big deal of a big inventory list? The software takes the concept of you handing your facility to an intelligent friend while you are on a 3 month sabbatical. Obviously, if you don't expect to be answering the phone every 5 minutes – or even keep a friendship at the end of 3 months – you better leave as much detail as possible in the hands of your friend. This software's inventory includes details like the public keys of the trusted devices, and the .bin files of the equipment that uses them. That way, when you friend needs to get a new firewall to replace a dead one, the turnaround time (and headaches of finding all the information already stored) can be minimized. The ISO 9000 style doesn't designate an enforced daily backup of .bin files. What is suggested is a process and systems approach that provokes analysis – is this best done weekly or monthly, what is being done similarly and in the same category. One can decide to make .bin files monthly or quarterly or perhaps when corporate policy mandated passwords are changed? In fact, any every any and every detail that you want to check should be put in one of the daily or weekly or monthly or quarterly or yearly check lists. Many examples and many manufacturers and their equipment models are already in the system. Now, you might think that the next most important action is to find the person who will run around filling out all these forms? But that isn't the way to be, "in the style of ISO 9000". The most critical person is assigned by the person in charge, the CEO or Executive Director, to be in charge of Quality Assurance. That person gets the mandate from top management as to the quality of service and support they want in their organization. That person may or may not get their budget from or report through Operations, but they mainly report to the CEO. That way they don't get into an argument about a budget issue – do we deliver this level of quality? or not? Part One will end here. In Part Two, more nuance like the importance of keeping some data in a RESTful state, and what it means to be Open Source. Two final notes then. One is that the system can be played with at: <www.dcinemacerts.net> – put the name and password of 'joew' into the front page to explore.